Let's make this precious...note Characters, starting from the top going down: Megatron, Ultra Magnus, Whirl, Cyclonus, Brainstorm, Skids, Tailgate, Nautica, Rodimus, Chromedome, Rewind, Ratchet, and Swerve. — Okkervil River, "Lost Coastlines"
On the planet Cybertron, the four-million year civil war between the Autobots and Decepticons has just come to an end. The democracy-promoting Autobots were victorious and have set to work rebuilding the society that was lost through the war. This victory came at a cost; the Matrix, an ancient life-giving artifact, was depowered in the final battle, rendered an empty shell. However, inspection of the shell revealed that the Matrix contained a mysterious star map. Enter Rodimus, a young upstart Autobot commander who, in defiance of High Command, decides to leave Cybertron on a quest. 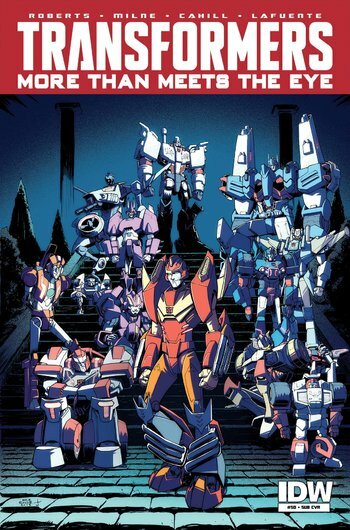 Rodimus and his second-in-command Drift believe the Matrix Map will lead to the Knights of Cybertron, an ancient order of warriors that legend claims gave civilization to the galaxy. An ongoing comic series set in IDW's Transformers Universe that began in 2012. The comic is a sequel to a previous ongoing (though that comic doesn't need to be read in order to understand this one) and runs concurrently with The Transformers: Robots in Disguise, a comic set on Post-War Cybertron. The series is written by James Roberts, who was brought on after the success of The Transformers: Last Stand of the Wreckers. Artist Alex Milne draws the series, with an occasional fill-in by Nick Roche and other artists. "Season 3" sees the title re-titled as The Transformers: Lost Light, with Jack Lawrence on art. From November 2013 to March 2014, More than Meets the Eye was part of a 12-issue Crisis Crossover event with Robots in Disguise called The Transformers: Dark Cybertron. Following the end of the event, several new characters joined the Lost Light crew, including a disillusioned Megatron who may or may not still be evil. In a rather unique touch, this comic has a soundtrack which can be listened to here . It has a character sheet. Feel free to add to it. It also has a recap page currently under construction, which is in dire need of Wiki Magic. All spoilers up to the end of Season 1 will be unmarked. Hello...? Can anybody hear me? It's-kssk! of the Lost Light.